Yvon Michaud and his wife Marie moved to East Hardwick in 1954 from Quebec, Canada with a small herd of dairy cows. They purchased a little farm along the Lamoille River and began to raise a family of six. From the beginning the Michaud’s have had an entrepreneurial drive in everything they do. While Yvon started with dairy, he branched out into maple sugaring. The maple sugaring business is still in operation today and is used in all of Kingdom Creamery’s maple products. Together they raised three sons and in the early 2000’s and all three sons came back to work on the farm fresh with agricultural degrees from Cornell and SUNY Morrisville. In order to accommodate three grown adults coming back to the farm, the farm expanded. Additional facilities were added as well as the purchase of two neighboring dairies. The herd grew from a 250 head count to its current size of 1,100 head count. There are presently 550 mature dairy cows, 450 of which reside at the original location, a free-stall operation; and 100 at one of the purchased dairies one mile from the main location. The farm is now managed by third generation family members Jeremy, Travis, and Daniel along with their wives. Currently the Michaud family is raising the fourth generation of farmers. So far there are nine members growing up on the family farm. With so many future farmers to keep busy, the Michaud family decided to expand once again! 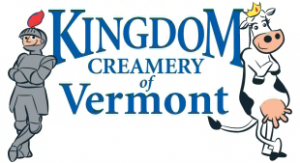 Kingdom Creamery Of Vermont is the result of that expansion. The Michaud’s have now constructed a state of the art dairy processing facility. This facility is located right across the street from their family farm! The dairy farm provides all the ingredients needed to produce Kingdom Creamery of Vermont’s high quality yogurt, ice cream & soft serve mix. When they say, “Fresh From Our Kingdom To Your Castle!” … they are not exaggerating at all!